A teenager has been jailed for a year after he was caught by police carrying a blade – twice in just two weeks. Bailey White, 18, was being hunted by police after reports he had threatened to harm a teenage boy with a knife twice. Both times he was stopped by cops he had a large knife on him, each with a blade five and seven inches long. White was first arrested after patrols found a weapon when they stopped the BMW 1 Series he was travelling along the A26 in Southborough, Kent, on January 24. The stop was made after Kent Police received a report he had threatened a person with a knife in Hadlow earlier that day. White, from Allhallows, Kent, was charged with possessing an offensive weapon and initially bailed to attend Sevenoaks Magistrates’ Court on March 5. He was arrested for a second time while he was waiting in the drive through of a restaurant in Tonbridge, at 2am on February 11 – the arrest was made following a report White had threatened to assault the same victim the previous day. White was again found with a knife, which had a five-inch blade, as well as a small bag of cannabis – he was charged and remanded in custody to appear at Medway Magistrates’ Court the next day. White, who overall pleaded guilty to two counts of possessing an offensive weapon in a public place and an additional count of possessing cannabis, was sent to Maidstone Crown Court for sentencing where he was jailed for a year on March 21. 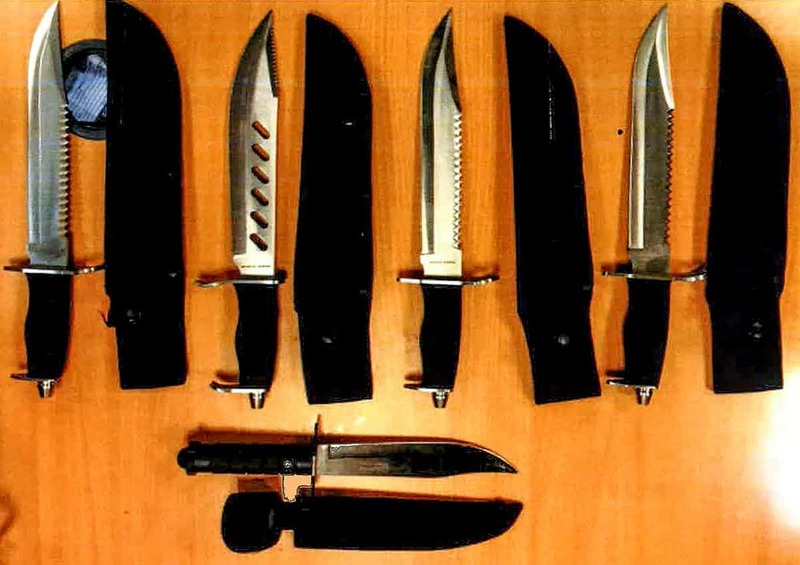 Investigating officer Police Constable Levi Caruana said: “This case is a clear example of Kent Police taking a zero tolerance approach towards people who chose to carry a knife in a public place. Stock image ofknives – not related to this case.